As someone who has read both Cows In Action books and Astrosaurs, it was really interesting reading a book with both of them together. Both of these series are action-packed, funny and exciting. So of course the book with both of them added together had to be twice as good! It’s very easy to understand and totally absorbing. You won’t be able to put it down! My personal favourite character in the C.I.A is Bo Vine, the gum-chewing, feisty milk-cow in the C.I.A. who lives with her brother Pat Vine and Professor McMoo on the same farm in the 21st century, even though they are the star agents in the 26th century based Cows In Action. My favourite character in the Astrosaurs is Captain Teggs, the captain of DSS Sauropod, the best spaceship in Dinosaur Space Service, an organisation protecting all plant-eating Dinosaurs in the Jurassic Quadrant from the bloodthirsty Carnivorous dinosaurs who want to invade and eat all of the placid plant-eating dinosaurs. The start of the book introduces the Cows In Action, a group of time travelling cows saving the Earth from the F.B.I, the Fed-up Bull Institute, and then introduces the Astrosaurs, a group of intelligent herbivore dinosaurs living in the Jurassic Quadrant (a solar system only populated with dinosaurs) saving the vegetarian part of the Quadrant from the blood-thirsty carnivorous dinosaurs living in the other half of the Quadrant. Later on in the book, the Astrosaurs respond to an SOS call from a small planet and walk straight into a trap. They find the horrible Dinosaur Moo-tants, half dinosaur, half cow, waiting for them, along with a weird space ship and a ter-moo-nator (half bull, half robot agents of the F.B.I.) and they barely escape with their lives. After they recover, they set off in pursuit of the mysterious spaceship, and find themselves face-to-face with an F.B.I. HQ in outer space! Meanwhile, the three best agents in the Cows In Action (Professor McMoo, Pat and Bo) arrive at the C.I.A headquarters in the 26th century, where a mysterious present from the Fed-up Bull Institute turns out to be another moo-tant, like the ones facing the Astrosaurs. After it is caught and held in a net, Pat, Bo and McMoo are whisked away in a spaceship to find out about the F.B.I’s actions in the Jurassic Quadrant. They too arrive in a Fed-up Bull Institute HQ. 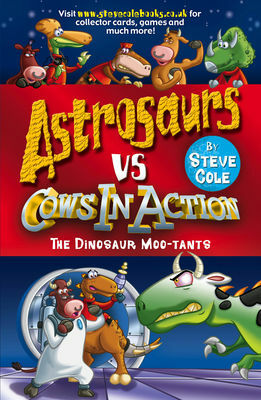 Will the Cows In Action and the Astrosaurs unite against the common enemy who threatens both their home planets? Or will the F.B.I. find some devious way to turn the two groups of heroes against each other? You’ll have to read it to find out!